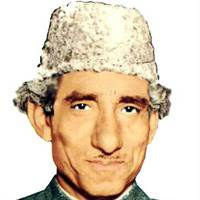 Eminent Poet Sufi Ghulam Mustafa Tabassum was born on 4th August 1899 at Amritsar. 'Tabassum' was actually his pen name by which he was known universally. Tabassum was born to parents of Kashmiri ancestry. He earned a Master's degree in Persian from Forman Christian College in Lahore and remained with Government College Lahore for his entire career, rising to head the Department of Persian Studies. The famous 'Tot Batot' character was created by him, including translating of many poetical works from Urdu and Persian into Punjabi. In 1966 he received the Tamgha-e-Nishan-e-Sipas award of the Government of Iran, and the Sitara-i-Imtiaz by the Government of Pakistan. He had been a prominent speaker on readio and television as well. Some of his works including 'Tot Batot', Dogona, Suwan Raine Da Sufna, Punjabi translation of Shakespeare's A Midsummer Night's Dream, etc. He died at Lahore in 1978.